Rogue Women Writers: Do you love adventure? Are you fascinated by secrets? Do you love adventure? Are you fascinated by secrets? Gayle Lynds: If so, you’re in the right place. We’re excited to share with you our stories about the worlds of espionage and geopolitics and our covert lives as authors. Trench coats not required. Prizes and autographed novels awarded. We’re eight best-selling, award-winning authors with the clandestine goods. What’s in our dossiers? We’ve held Top Secret security clearance at a think tank. Raced camels in the Middle East. Been a CIA analyst. Earned a black belt in Aikido. Hopped from Israel to the Ukraine and other global hot spots. Trained at Le Cordon Bleu. Survived survival schools. Sat in the Situation Room as Senior Director for the National Security Council. And been working journalists and lawyers and TV analysts. You may have noticed we women authors are something of a rare breed in international espionage fiction, which makes the Rogue Women Writers blog all the rarer. We write in the field because we love it, and we’ve come together because we enjoy each other’s books and collegiality and want to get to know you, our readers. Devious people: you’re our favorites! On the other hand, if you have a devious mind, please feel free to think of us as a cabal, a directorate, a sub rosa organization that will rendezvous online with you regularly on Mondays, Wednesdays, Fridays, and Sundays. And watch for us at conventions like ThrillerFest and Bouchercon, and at libraries, bookstores, and other events, too. In our first blogs, you’ll learn something about our secret lives — how we came to write what we do. I was elected to inaugurate the blog, since I was the one who sent out the call that assembled our crew. My name is Gayle Lynds, and I write spy thrillers. Why? Because I find so much that fascinates me in espionage and geopolitics. Some examples from my books . 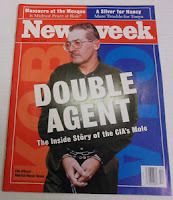 . .
A few years ago one of my sources asked me a provocative question: “What if someone like Aldrich (“Rick) Ames was actually innocent?” Rick Ames was one of America’s worst traitors, responsible for the executions of several of our most valuable assets in Moscow as well as blowing the cover of our own undercover officers. It was unthinkable that Ames wasn’t guilty. Still, I was intrigued because I’d never considered the possibility. After a couple of years of research and writing, I finished The Last Spymaster. It’s the fictional story of Jay Tice, chief of the CIA’s Clandestine Service and a legend in the Agency — until he’s charged with espionage and sentenced to a maximum security prison. In the story, Tice escapes after three years without tripping an alarm or leaving a trace. Did someone who believed in him help him vanish? Was he really guilty, and if he wasn’t, what does it say about the CIA — and Tice himself? My interest in Rick Ames had made me realize that our traitors had been coming from the CIA, but there was no way the CIA had access to some of the information and people who’d been compromised. From what I could figure out, there had to be a mole in the FBI. With that idea, I wrote Mesmerized, in which I created a traitor buried deep in the FBI and owned by the Russians. My imaginary character's name was Robert. Within two months of the publication of Mesmerized, a real man named Robert — an FBI Special Agent — was arrested on espionage charges and sentenced to life imprisonment. 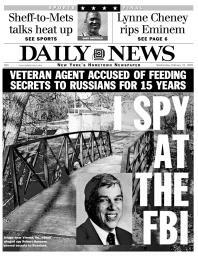 To this day, that man, Robert Hanssen, is considered the traitor who most damaged the United States. Was my novel about the FBI mole named Robert a coincidence? Absolutely. But at the same time, my research and contacts had been fueling my writerly imagination. As the tragedies of 9/11 were unfolding, my literary agent called me from New York, distraught. “Who could have done this?” he wanted to know. I remembered my research for The Paris Option, the third book in the Robert Ludlum Covert-One series, which I’d written. All through my writing career I’ve been driven by my fascination with secrets, political power, the booted feet of history, bedroom and backroom betrayals, the crises that reveal our strengths, the temptations that destroy us, and the moments when our humanity is revealed. The world of international espionage is large and important. Our policymakers rely on it. How could I not write about it? What about you, dear reader? What fascinates you? I am fascinated by spy stories. (Love the Bond movies.) Although I've been a fan of Ludlum, LeCarre, et al. I'm very happy to meet you ladies. More books for my toppling over TBR pile. Diane Burton ... We're delighted to meet you and thrilled you're coming along for the ride! I love the fact that you predicted Robert Hanssen, Gayle. I was actually an analyst at the Agency when Rick Ames was arrested--and people I trained with were blown by him to the then-Soviets. They were forced to quit and find other careers. The damage Ames did was inestimable. I watched a middle-aged former Moscow handler choke up and cease speaking as he discussed the torture and execution of an asset Ames had betrayed--a man he'd grown to think of as a friend. The fact that Ames had grown up as an Agency brat and had a revered father made it all the worse. Thanks for these insights--love them! I loved both The Last Spymaster and Mesmerized and knowing the real life examples that sparked your stories is fascinating, Gayle. Also to learn that Francine had some real life experiences that tied to both of those men. Makes me want to go and reread the books! Gayle, I'm so curious: are you researching anything currently? You seem to be ahead of the curve! 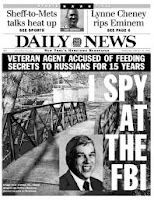 I was fascinated to read the background for The Last Spymaster, a great spy thriller, and even more fascinated to learn that you had predicted Robert Hanssen. Way to go, Gayle.